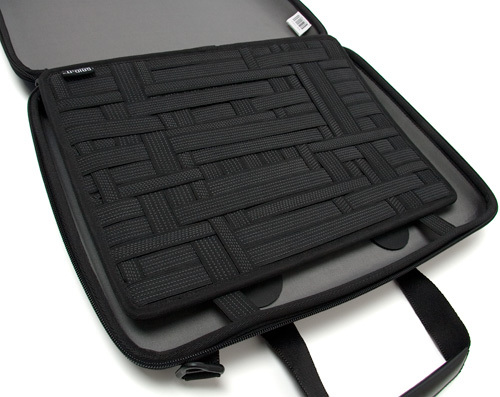 Hands-On With The Cocoon Laptop Case Featuring The GRID-IT Organization System | OhGizmo! CES is a veritable playground of every type of electronic device you can think of, but one of the things that really caught my eye at this year’s show was a line of laptop bags and gear cases of all things. Now if you’re the type who just crams all of their toys in a bag and couldn’t care less about what happens to them, there’s a good chance you’ll have no interest in this post. But if you’re like me and need to be assured your stuff isn’t going to get dinged or scratched up in transport, you might want to take a few seconds and check out my hands-on look at the Cocoon laptop bag. 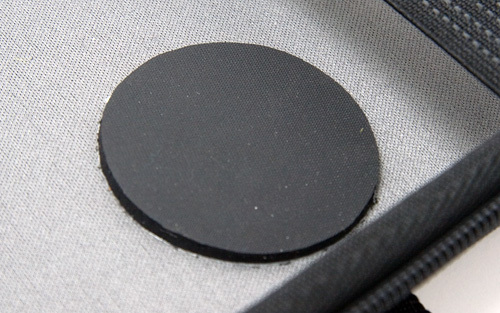 I was sent the company’s 15-inch laptop case to have a look at, which they describe as having “an ultra-simplified form factor that is streamlined for performance without theatrics.” And they’re not kidding. 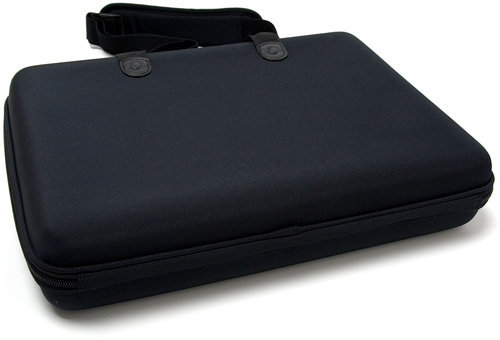 The bag features a shock absorbent molded case which is extremely clean and simple. I don’t know about you, but I don’t necessarily want to draw attention to myself when carrying around a bag with a laptop and other expensive electronics inside, and the Cocoon feels like it will go mostly unnoticed, which is great. One addition I’d maybe like to see is a set of rubber feet on the bottom of the bag. More often than not when traveling you need to set your laptop bag down, and keeping it upright and balanced between your legs isn’t always an option. And even though the Cocoon does feature a stiff molded case, the bag will not stand up on its own without tipping over. I’ve also found that I’m more comfortable setting a bag down on the ground if there’s a set of feet that will get dirty, instead of the bag itself. 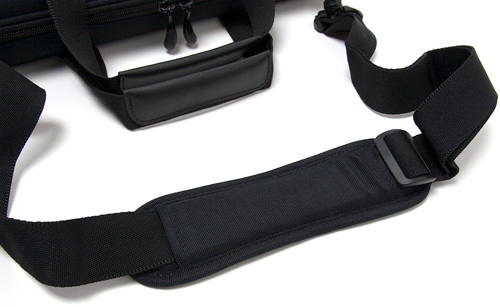 The bag comes with a set of standard carrying handles, and even though they are padded, they’re not overly comfortable to use for long periods of time. But I’m sure part of it was the fact they were new, and after a bit of wear and tear they’ll probably soften and become more comfortable to hold onto. But most people will probably rely on the included padded, adjustable shoulder strap for carrying the bag, though it can be removed as needed. Again, it’s nothing fancy, but that seems to be one of the driving disciplines behind the design of this company’s bags, so it’s definitely nothing to complain about. 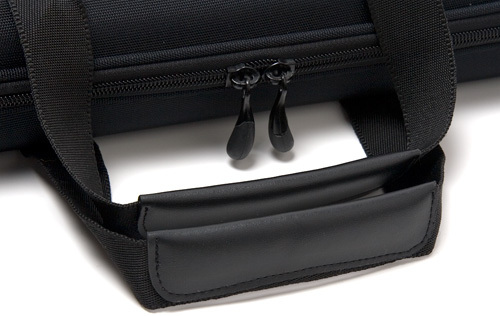 Now in past reviews I’ve lamented about overly obvious company logos on bags or other gear, since I’m not a fan of being a walking billboard, but the Cocoon laptop bag only has a simple rubber logo stitched into one of the seams on the outside of the bag. It’s small and subtle and easy to miss, which is what I prefer. Moving onto the inside of the Cocoon bag you’ll find that it’s just as simple as the outside. However, there is one obvious feature that sets it apart from all of the other bags currently on the market, but I’ll discuss that shortly. 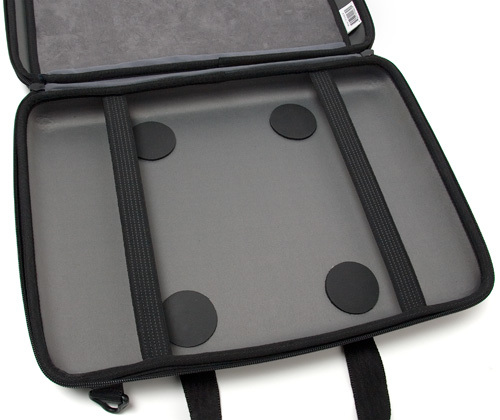 On one side of the bag you’ll find a pair of elastic straps as well as a set of padded non-slip round pads that are designed to hold your laptop in place and prevent it from sliding around. Yep, round, padded and non-slip. 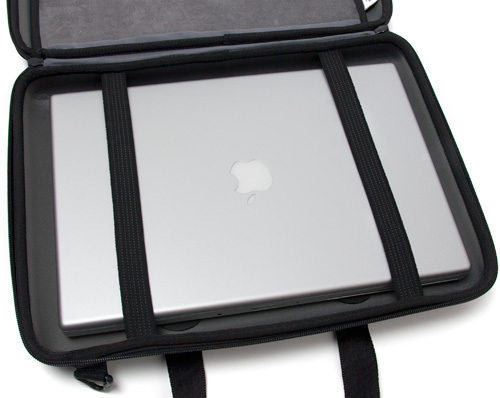 For these photos I tested the laptop bag with a previous generation MacBook Pro, and as you can see, it fit perfectly. Now the elastic straps weren’t as snug as I thought they’d be once the laptop was inserted, but combined with the non-slip pads underneath the MBP, they really did prevent it from sliding around or shifting when I tried it carrying it with the bag closed. 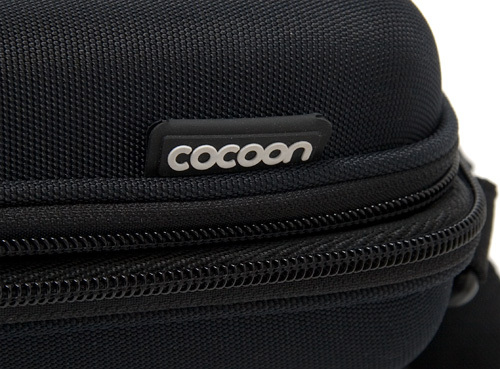 I’ll also point out that Cocoon advertises this bag as being airport-friendly. Now I’m not 100% sure if that means the bag can be sent through a scanner without having to remove the laptop first, but the design definitely makes it easier to remove the laptop if you have to. Now on the other side of the bag you’ll find the fun part. (That’s right, I find organization fun.) 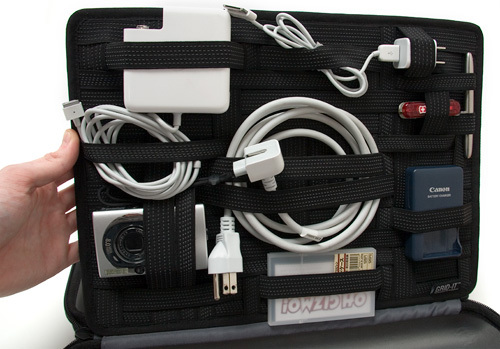 The ‘killer app’ for the Cocoon line of laptop bags and cases is the company’s GRID-IT organization system and not only is it rather clever, but it also works like a charm. The GRID-IT panel looks somewhat like a woven basket, but instead of using straw or reeds or whatever baskets are made from, it uses a web of elastic straps that’s strategically designed to accommodate objects of random sizes and shapes and hold them securely. 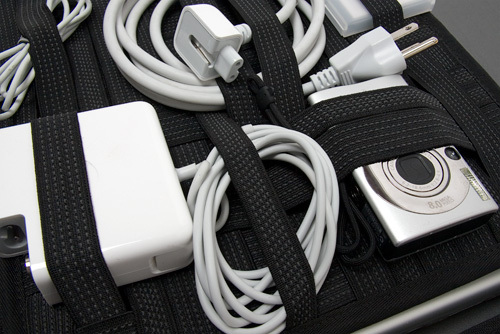 Here’s a better look at how the mish-mash of elastic webbing is actually quite flexible when it comes to storing everything from cords to electronics. 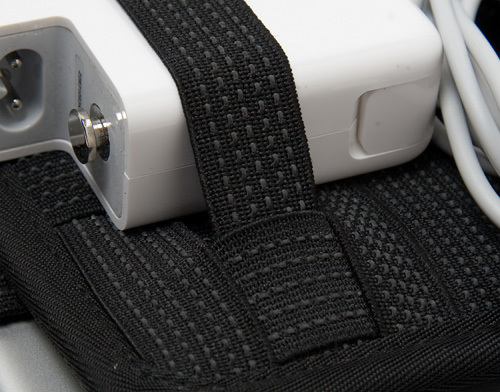 And the elastics are incredibly stretchy, so you can actually accommodate very large objects with ease, though you’ll want to be careful as anything too big will prevent the laptop bag from closing. And if you look even closer, you can see that the elastic webbing has a series of lighter gray stitches running across them. But these aren’t a style accent, they’re actually thin strips of a non-slip material which works with the tension of the elastics to prevent any objects secured by the GRID-IT system from falling out. Here you can see me holding up the GRID-IT panel with everything secured, and even though you can’t really tell with just a photo, nothing came loose or slid out of the elastic webbing when it was lifted. And with the laptop bag zipped shut, the chances of something coming loose are even less. 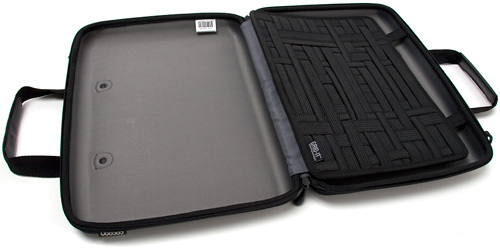 Of course, nothing is perfect, and I do have one minor gripe about the Cocoon laptop case. 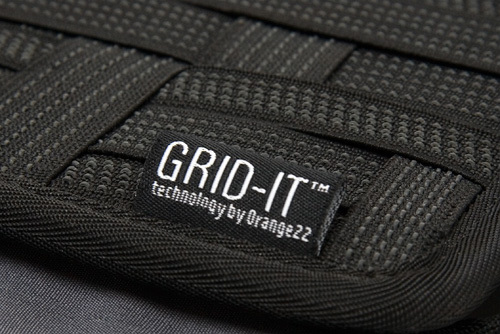 The GRID-IT system is designed to replace the collection of pockets and slots that other laptop bags use to keep things organized. The clean and streamlined approach is great, but there are times when a pocket or two does come in handy. For example, the GRID-IT panel is pretty much useless for storing papers or documents. Unless they happen to come in scroll form, and even then, there’s a good chance the elastic webbing will simply crush them. So there’s no real place to stick a boarding pass, or a magazine so that when the laptop bag is opened, they’re not just floating about inside, ready to fall out. But otherwise I really think Cocoon is onto something great here. The CPS400, which is the laptop bag I was sent, has a modest price tag of $69.99. It’s not the cheapest bag on the market by any stretch, but it’s well worth the money. 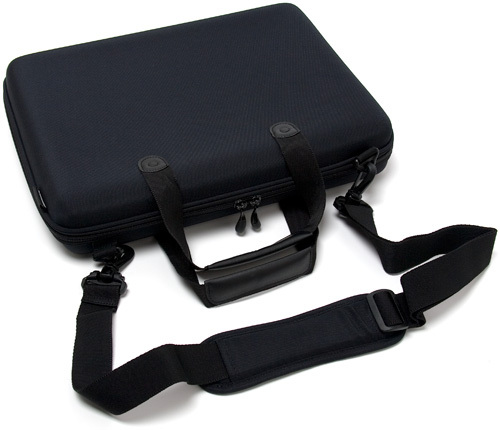 And keep in mind the company also sells a wide range of cases and bags featuring the GRID-IT system that are quite reasonably priced, so even if you’re not in the market for a laptop bag, there could still be something you might find useful. In fact the only thing missing is a large 6-foot by 6-foot GRID-IT panel that I can stick to my wall in other to keep my office organized. What is so special on this laptop bag is it's organization system. 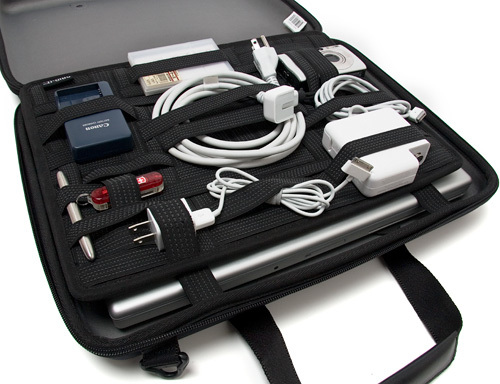 Most of us bring tons of supporting devices for our laptop and this system helps to lessen the mess on our own laptop bag. 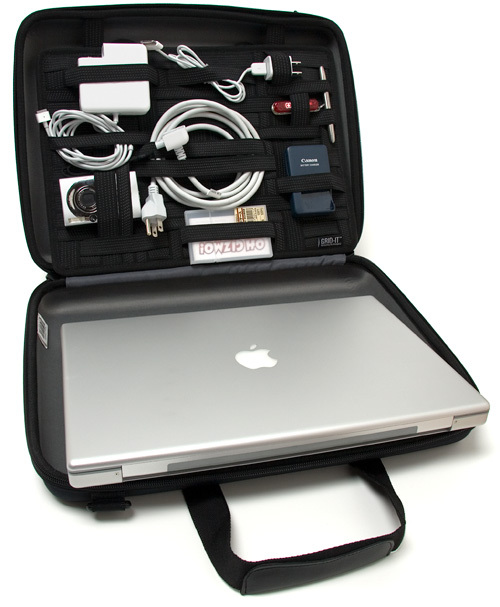 What an amazing laptop bag, I can really put what ever in it without bumping them in the bag. Very brilliant idea!! Very Creative laptop bags!! !